"The Art of Restoring Function to Enhance Appearance"
Calendar of Events - SEDA Season 2018/2019! PLEASE NOTE NOVEMBER'S DATE CHANGE! SEDA is an AGD/PACE approved provider of continuing education (ID#217688) with its license expiring 11/30/2020. are held by identifying themselves as such when booking over the phone or by using the link above! Our last meeting of SEDA's 2018/2019 season (our nineteenth!) 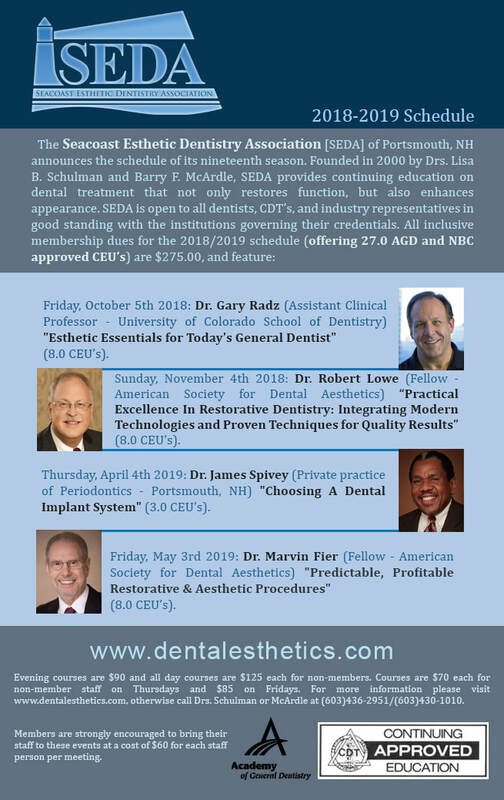 is fast approaching on Friday, 5/3/19 and will feature Dr. Marvin Fier (fellow - American Society for Dental Aesthetics) speaking on "Predictable, Profitable Restorative & Aesthetic Procedures". Dr. Fier's presentation is sponsored by DMG, Garrison Dental Solutions, Kuraray Noritake and SS White.